Last month we happened to get both red and golden beets from our CSA share (Community Supported Agriculture). We chopped and tossed them with some olive oil and herbs and were on our way to a lovely vibrant salad. It’s so easy, you’ll wonder what took you so long to try beets. 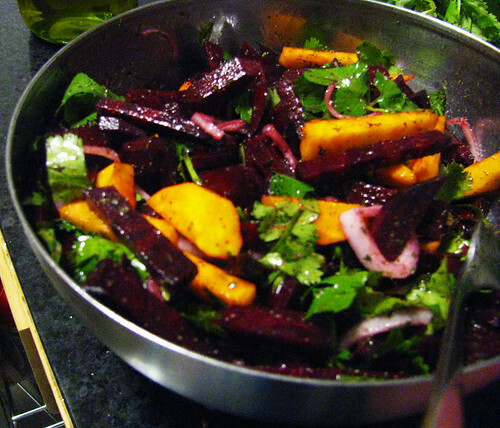 Chop and slice the beets into strips, similar to a double-wide julienne and add to a medium-sized bowl. If you don’t feel like chopping, it’s totally okay to use the shred attachment on a food processor. Chop cilantro and add it to the bowl along with the chopped red onion. Mix all three together, then add the lime juice, oils, vinegar, salt & pepper. Mix all to the desired wetness and taste, trying it as you go. Some folks may prefer more oils and vinegar.